COPrevent: Your Invitation to Healthy Dining is Here! RSVP by Friday, May 10. Your Invitation to Healthy Dining is Here! RSVP by Friday, May 10. Healthy Dining, the University of Colorado’s Anschutz Health and Wellness Center, area restaurants and other stakeholders are teaming up to contribute to a healthier Colorado! Healthy Dining invites your organization to join with us to amplify the efforts of this important public health initiative on May 22, 2003 from 10:00-11:30 am at the Anschutz Health and Wellness Center. 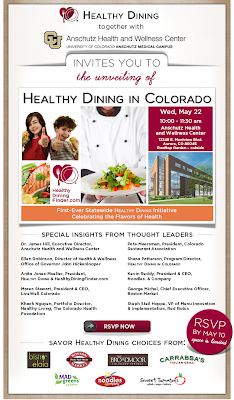 RSVP for the unveiling of Healthy Dining in Colorado Here! This statewide program, building upon the success of Healthy Dining’s nationwide program, will work to 1) increase the availability of Healthy Dining- and Kids LiveWell-approved menu choices served in Colorado restaurants and 2) educate and inspire Coloradans to choose the Healthy Dining and Kids LiveWell menu choices when eating away from home. With nutrition criteria based on Healthy Dining's registered dietitians' years of experience and recommendations from the USDA, as well as a special section highlighting sodium savvy choices, Healthy Dining in Colorado will serve as a model for other states.